Taking kids of any age to a music festival is a daunting experience for most parents. Despite many modern festivals welcoming families with open arms, we have to always remember that they weren’t designed solely for the benefit and enjoyment of critters. They are major events with a mass appeal. You’ll bump into everyone from newborn babies, to teenage ravers with alcopop issues, to pensioner hippies revelling in the mystique and spirit of their environment. So, with this in mind, we’ll guide you through the steps that you can take to ensure the safety and welfare of your prized offspring this summer so that you too can sit back, relax and enjoy the magical sights and sounds that surround you. Enjoy. Let’s face it, most of us have had moments of panic when our pesky, fleet-footed toddlers escape our watchful gaze for a split second in the park or supermarket. I still remember legging it around our local Range store after Jesse decided to play an impromptu game of hide and seek as I bent down to get something off a shelf. It’s gut wrenching! So it’s completely understandable to feel anxious about this happening at a major festival with possibly 100,000 revellers around. But fear not, there’s a bunch of things you can do to minimise this in the first place and then deal with it if the worst does happen. Unfortunately, older toddlers may take issue with these in their usual dramatic way so thinking about how you position your tents on the campsite and where you choose to sit or stand in the fields can all help. If you are camping as group aim to position your tents in an enclosed circle. This leaves the middle ground as a safe area free for the children to eat, play, dance and tease each other whilst ensuring that between you, you are able to surveil them from all angles. It also means that due to the position of your tents you can explain to your inquisitive critters that they are a barrier not to be crossed without grown ups. This is far harder to achieve if you camp in a straight line. For older children, also ensure that you tell them which campsite you are on and, if there are numbered sections or warden posts, which one you are positioned by. In the festival fields themselves sit or stand by a large and very noticeable object and familiarise your kids with it so they are able to recognise it quickly. If you are there for a few days this will certainly help them and you. At Kendal Calling, for instance, we like the large tree at the back centre of the main stage crowd. It is tall enough to be recognised from a distance by the low standing height of children, it is away from the major hustle and bustle of the main stage crowd, and it also tends to attract other like-minded families. Perfect. You’ll also see many families and large groups carrying some sort of raised flag or banner on either a spare tent pole or telescopic lightweight flag pole. Again, these are great as they create a very easy to spot and follow focal point, particularly when meandering your way from stage to stage. Just aim to buy or create something unique and memorable to standout. These can also be used on the campsite to further help identify your tent and area to make it even more recognisable to your kids. Mrs Potty Adventures, 34 weeks pregnant, begrudgingly holding Mr Potty Adventures can of beer under our designated tree while Jesse sleeps in his wagon. 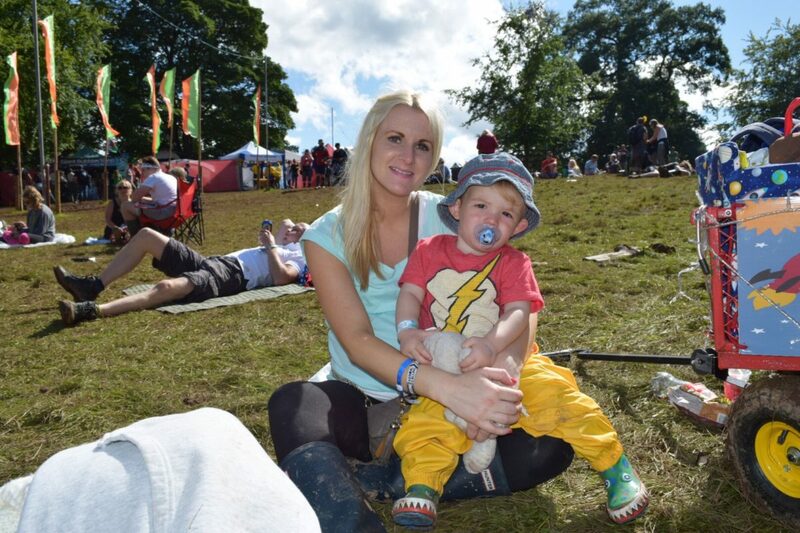 However much we all resist thinking of the worst, if your child does leave your sight at the festival there are many easy things that you can do in order to ensure their quick and safe return. For this part of the series we got together with Sian from Lles Welfare (https://www.facebook.com/lles.welfare1/), a charity group that works at many of the UK’s major festivals to provide welfare support. In fact when we attend Kendal Calling in a few weeks time, a team from Lles Welfare will be there specifically for lost children, so who better to give you advice! The first thing that is urged is that all children are wearing ID bands. These are cheap and readily available but provide valuable information should a child become lost. It is suggested that you put your names on the ID band rather than your child’s name and ensure that you put as many mobile phone numbers on it as possible as it’s easy for a battery to drain at a festival, so always make sure one phone is left charged in case of emergencies. More expensive bands are also now available that work with the GPS in your phone via a dedicated app. These provide extra security as you are able to pinpoint the location of the ID band on your phone. Another great tip is to familiarise your children with the welfare tents. These are often centrally located and are manned 24 hours a day by charities such as Lles Welfare and St John’s Ambulance. Take them for a visit on your first day and ensure that they know that’s where they should head to if they suddenly become lost in the festival fields. Likewise, many of the onsite campsites have welfare/warden points located at their entrances so familiarise your critters with those too. As the entrances are often surrounded by tall outdoor floodlights these are easy to spot in a tent crowded field. A final top tip is to take a photograph on your phone every morning of your critters. This means that should they become lost you are able to give stewards a photo containing exactly what clothes they are wearing that day, which really helps them to identify a child in a crowd. Festivals should not be events to worry about. They should be events that you love as a family. So, by dedicating just a little forward planning time before you arrive and then taking the steps above once you’re onsite you should be able to relax and have the weekend of your lives. As ever, if you have any top tips that you’d like to share with us, please don’t hesitate to let us know. In the meantime, if you missed any other parts of this series on taking kids to festivals they’re just a click away. Thanks for sharing this with #whatevertheweather These are great tips. With regards to the bands I also wondered whether the tents flag could feature on the band too? That’s a great idea – making the parents easy to spot in the event of a lost child being found or getting disorientated. Thanks! Some of them are so family friendly now they really do make for a brilliant weekend away with the kids. Thanks for reading. Great tips! I never thought of taking a picture or your child is helpful in that kind of situation too .Thank you. My boys are 17 months old and they like to run away from us so I will need to review these tips when we go to a crowded place. A lot of them are so family friendly these days – they’re a great weekend away with the kids. It really is scary isn’t it. I’m just had your sister found them. The welfare teams do such great jobs at big events. It can sound quite worrying when you start to think of all the things that might go wrong with young children at a festival, but your tips here are great for practical ways to make sure they don’t. I remember trying and failing with reigns on mine, but they are such a sensible idea for a festival. The welfare teams sound a great idea for ensuring everyone is safe and the tent pitching plan with a central play area is inspired. Yeah the welfare teams do a tremendous job every year. Thanks for hosting and reading. Thanks for reading. I hope you all have a great time at the festival this year. Thanks so much. Yes I can imagine that once they start going on their own that’s a whole new area to worry about. I’m sure they’ll have a great time! It really depends what type of music you’re into and how important the music is to you. We are huge music fans so start our festival search that way but there’s plenty of family friendly festivals where music comes second. I’d say start small and work up. Something like Elderflower Fields or Shambala would be great starting points. Haha if you take enough wine with you you’ll be totally unaware of their 4am antics! Thanks for reading. Wow, I’m in awe of anyone who tales their kids to festivals. I would love to do it when the girls are a bit older; this is a great guide. Thank you, much appreciated 😄. And you really should, a lot of them now are really family friendly and make for great weekends away.